With the Russian River 300k rapidly approaching in early March, this past weekend was one of the few remaining opportunities I had left to put in some hard miles. 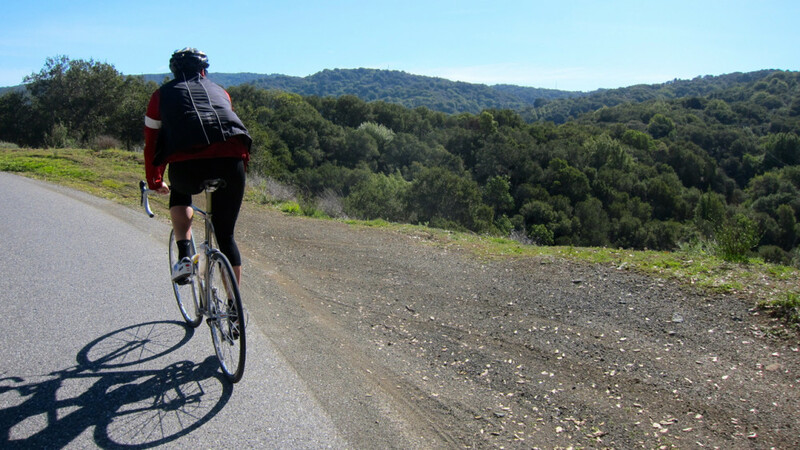 I scanned a map of the Bay Area to see where I hadn’t ridden before — I get bored with pedaling the same routes over and over again pretty quickly — and spotted Mt. 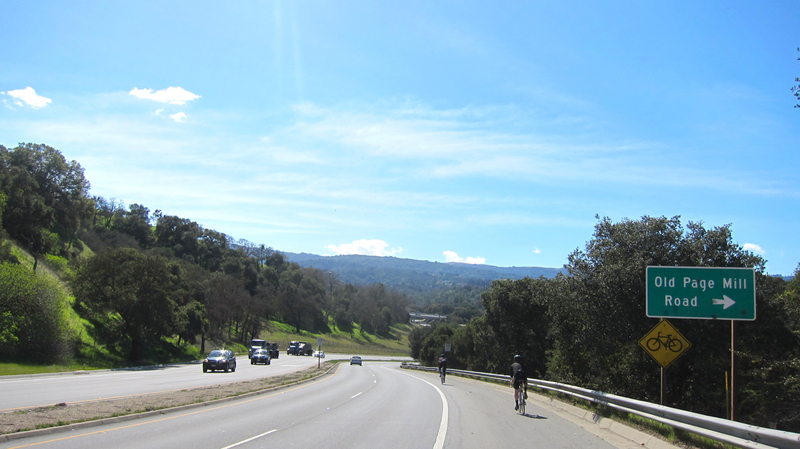 Umunhum in the South Bay. 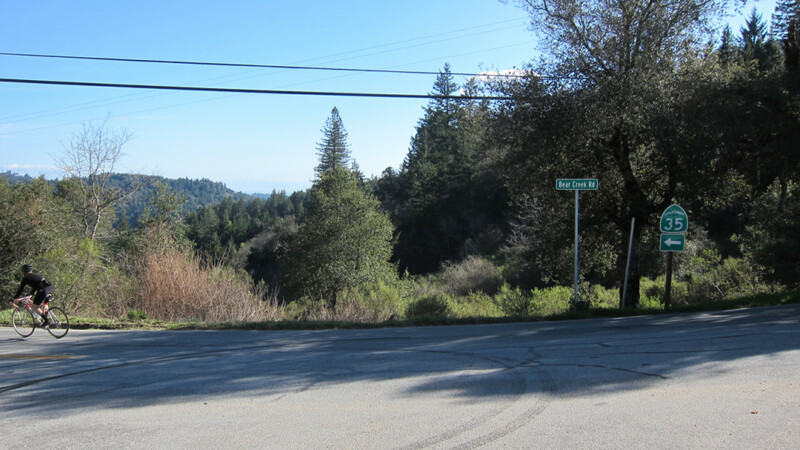 It’s the 4th-highest peak within the Santa Cruz Mountains and the former site of Almaden Air Force Station (here’s a great video about its history from the science program I work on.) Since I’ve already ascended Mt. Tam, Diablo and Hamilton, “Mt. Um” would be a great new challenge. TBO and I were joined on our quest by our friends Nick and Daniel; none of us had made the journey up Mt. Umunhum, so this would be a new adventure for the entire group. 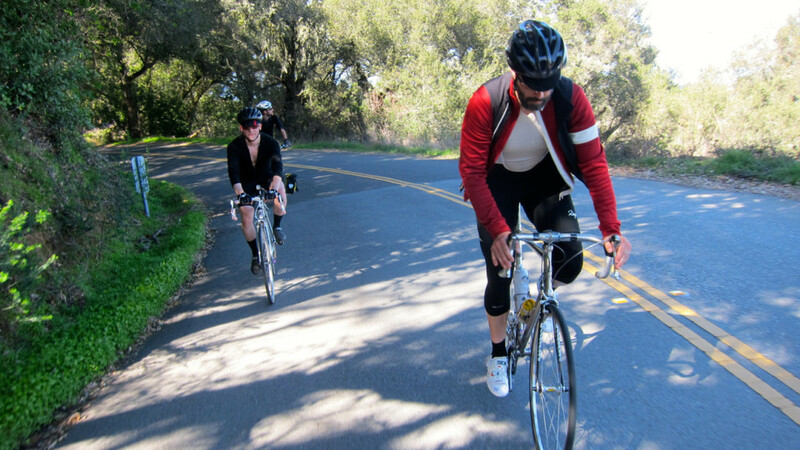 We met up in Millbrae to start our ride and quickly hammered through the flatlands of El Camino Real until we reached Page Mill Road near Palo Alto. 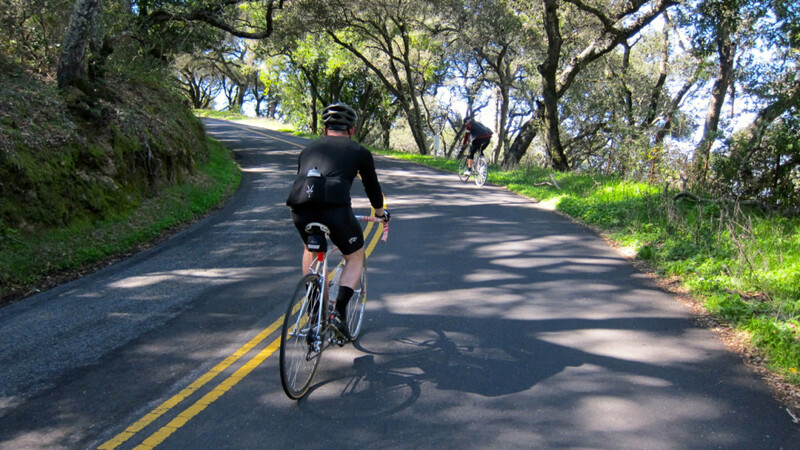 This is a favorite training climb with locals that begins near Stanford campus. 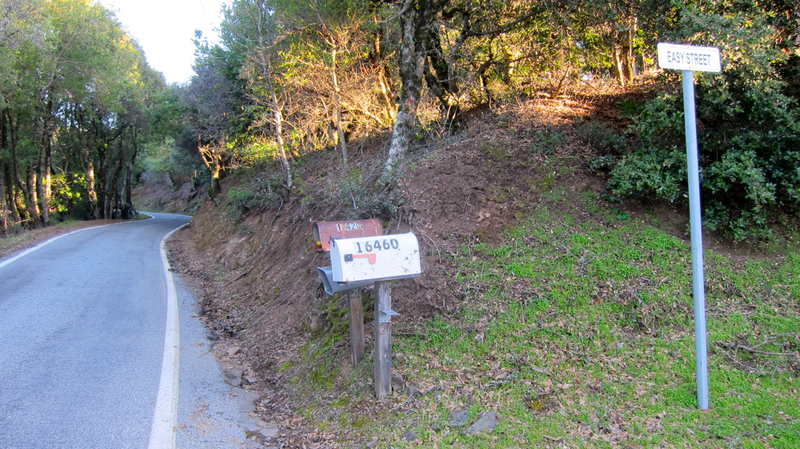 It heads up about 8.4 miles to Skyline Road for an approximate elevation gain of 2000 ft. The grade fluctuates between 7%-15%, so it’s a good quad burner that leads to scenic views of Silicon Valley. 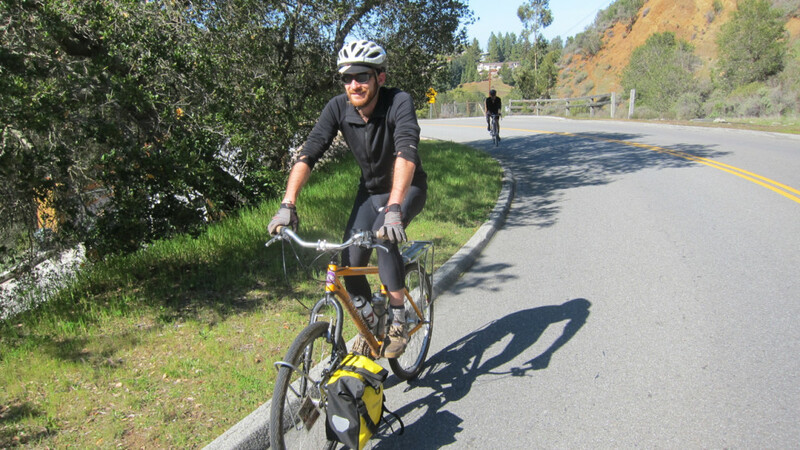 Our friend Nick was riding his touring bike with sneakers and platform pedals, while Daniel was rocking just a 12-23 cassette in the back — you know, just to give their legs an extra thrilling burn. Yes, he tackled this entire ride on that bike and kept up with us the whole time! 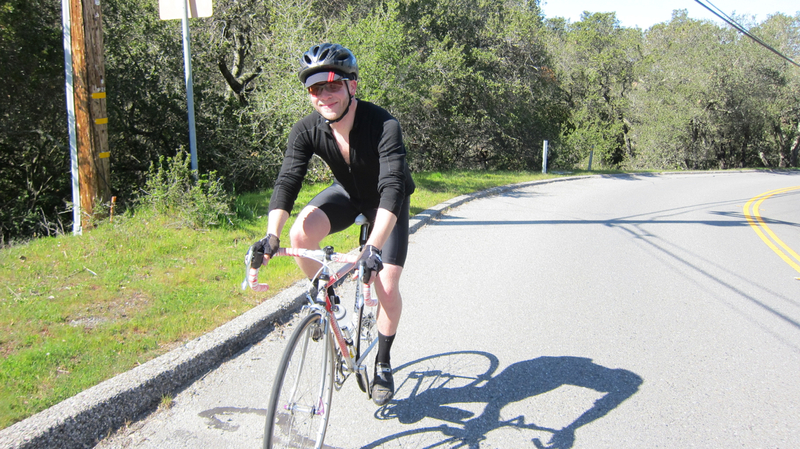 This photo was taken before the climbing got crazy on Page Mill, so Daniel’s still smiling. 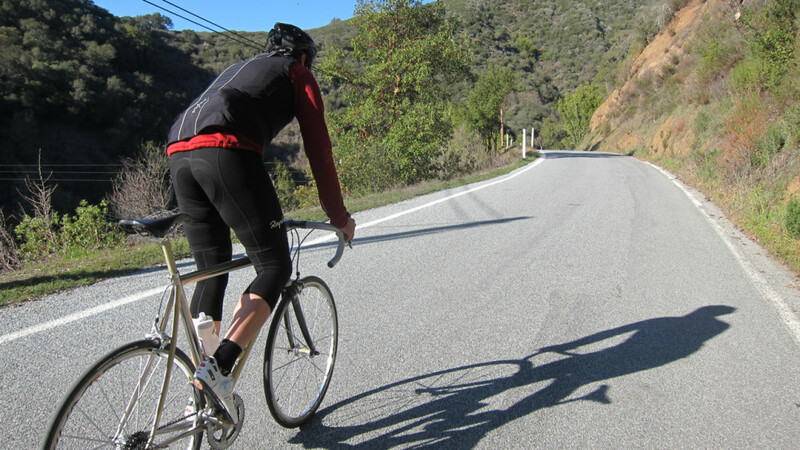 This road is scenic…and steep. Grinding our way up Page Mill Road. 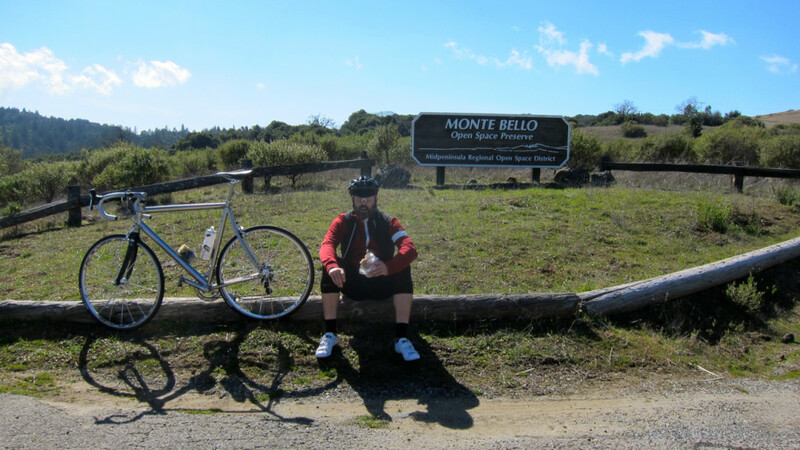 Just before we reached Skyline, we took a quick snack break at Monte Bello Open Space Preserve. Judging by the numbers of mountain bikers warming up in the parking lot, this seems like a great area for off-roading. 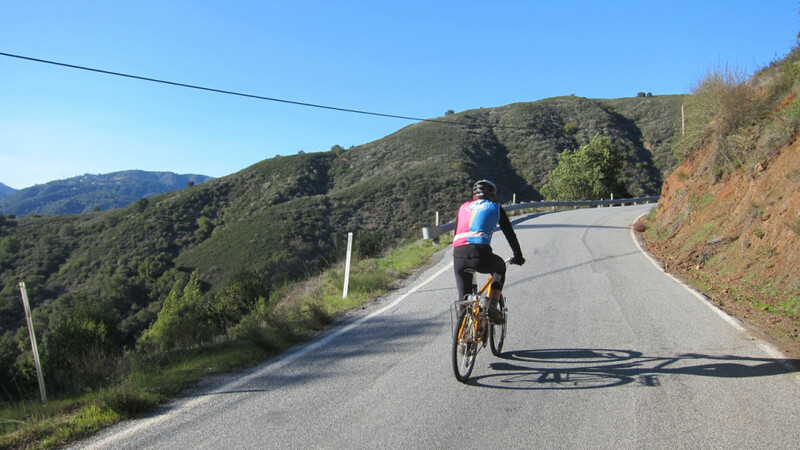 Skyline is a beautiful, rolling stretch of road that gives you glorious views on a clear day. 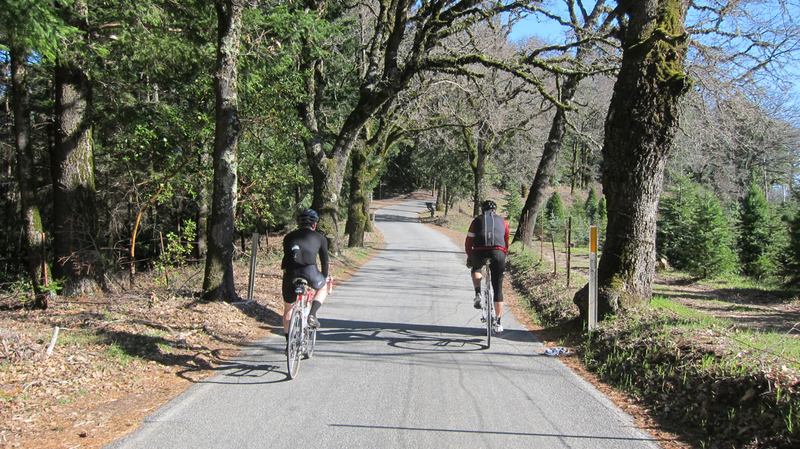 Just past the intersection of Black Road and Skyline, the road narrows to a single lane and passes by a series of quaint Christmas tree farms and lovely wooded sections. This was Christmas tree farm country, as you can see to the right of us. 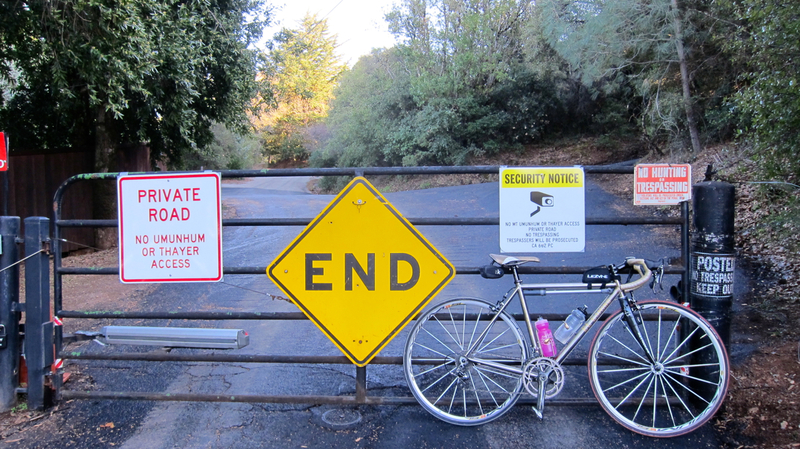 About 20 miles later, it was time to bomb back down into the urban jungle via Bear Creek Road. This long, swooping descent took us to Hwy. 17 near Lexington Reservoir. 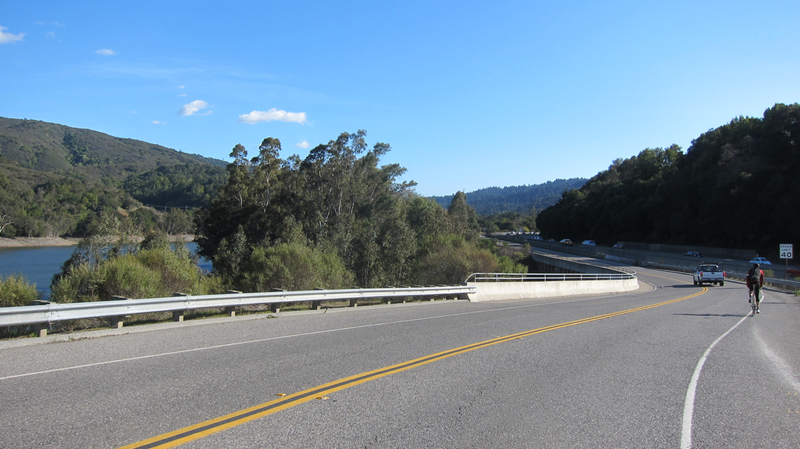 After some GPS confusion, we got a bit turned around until we made our way to Soda Springs Road. We were greeted by a sign that said, “No Outlet After 6 miles” (or something to that effect). 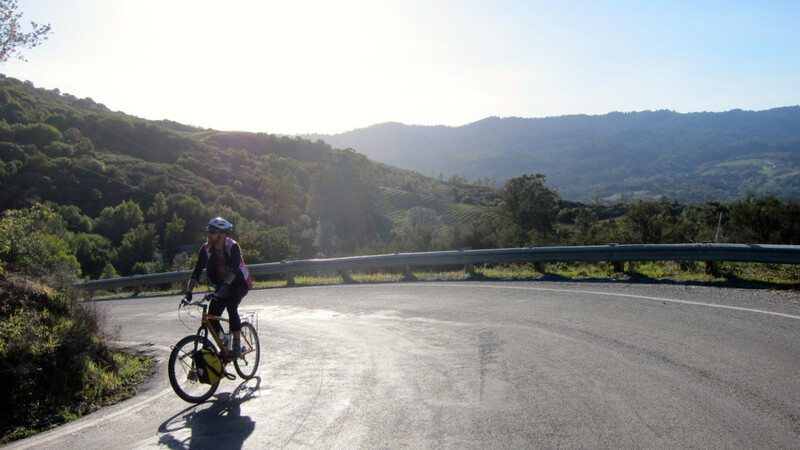 According to TBO’s mapped route, we were supposed to be able to connect with Loma Almaden Road to Mount Umunhum. After a few minutes of debate, we decided there was only one way to find out — by going up. 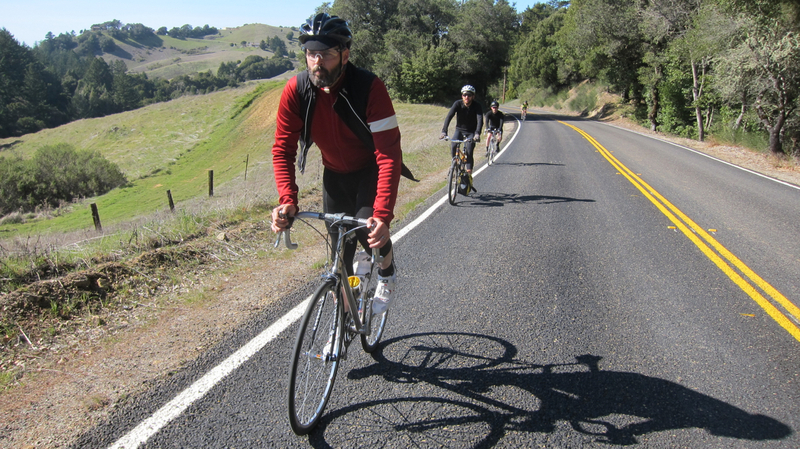 Soda Springs Road feels like an interminably long climb, especially after you’ve done Page Mill. And we were all out of water, since there wasn’t any along our route since we left Palo Alto. But we had come this far, we weren’t going to turn back now! Naturally, we stayed on Steep Street. TBO and Daniel had snuck into a house for sale that happened to be unlocked, so they had replenished their water supply. We all drank some water and readied ourselves for the freezing descent that awaited us. Both TBO and Nick had some scary near-misses with cars that were driving way too fast on the narrow road, but luckily they stayed safe. 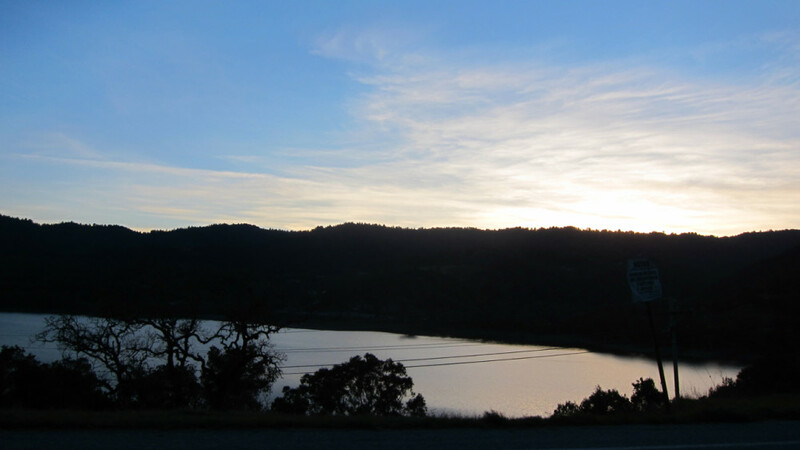 After making our way around Lexington Reservoir by sunset, we made our way to Los Gatos for dinner. The final flat ten miles to the San Jose Caltrain station felt luxuriously easy after the day’s riding. We were ready to kick back and relax. 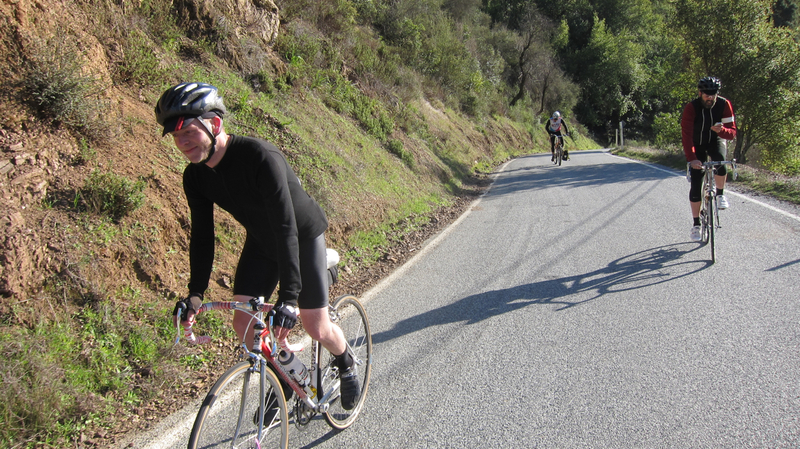 Final stats: 81.61 miles, 6992 ft. of climbing.